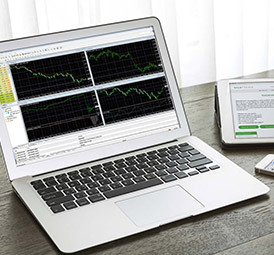 People gravitate towards Forex trading for a few reasons. 99% of these reasons involve money, and that’s okay. Money is a powerful motivator, and there’s lots of it flowing through the Forex market each session – topping nearly 4 trillion per day. Trillion! Just to put that in perspective, not one person, or even one business has made it even close to the ‘trillionaire’ mark yet. It’s a lot of money. Naturally you want your slice of the action and you’re willing to do what it takes to do get it…or are you? Maybe you think you’re ready, that’s what a lot of new traders think – and they end up disintegrating their accounts. It’s great to set ambitious goals, but Forex trading is on a whole other level of any challenges that you’ve likely encountered before. The path to trading successfully is an epic personal journey within itself – and there are a few factors to consider that are going to help or hinder you along the way. In today’s article we’re going to have a look at what it really takes to become an accomplished, confident trader. Most people don’t have luxury of doing what they love in life. Instead, they are forced to go through the monotonous day-to-day grind, waking up early, getting stuck in traffic and putting up with a boss who wants to squeeze every bit of productivity out of them while paying as little as possible. If you’re not building your own dream, you’re efforts are building someone else’s for them. Looking to escape the confines of your normal day-to-day life? 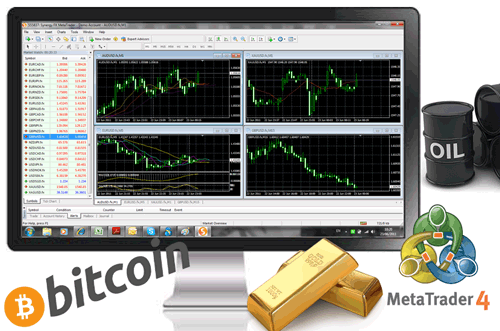 Want to leverage the opportunities Forex trading brings to the table and expand your life to another level? Welcome to ‘Club Forex’. 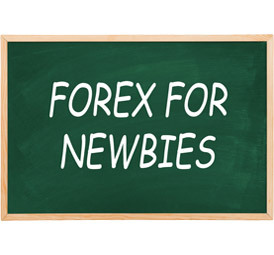 It’s no surprise Forex trading draws a lot of interest – It looks like an easy way out. Buying and selling from the comfort of your home computer – or even on the go with a tablet or mobile phone these days. Don’t go quitting your day job just yet, though. 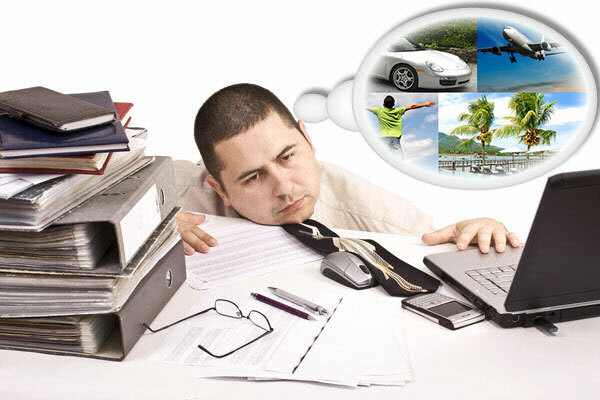 The appeal of earning easy money while achieving a more relaxed lifestyle seems ‘so close’. Working in your pajamas from the comfort of your own home is an enticing thought, isn’t it? But, it’s not like that at all. Being a trader is not a 1 to 1 exchange with your day time job – they both require different kinds of skill-sets & mindsets. Forex trading can’t really be compared to your full time job – where the more effort you put into it, the more money you get out. Forex is the opposite, the more hours you spend in front of the chart, the less success you are likely to see. Doesn’t sound right? Normally, if something goes wrong in the workplace you might get a slap on the wrist – but your boss or the company’s bottom line are the ones who really suffer for your mistake. Whereas, if you melt down in front of the charts with Forex, no one will be there to take the blame and you will suffer the full consequences of any decision you make. Successful Forex trading is all about being in control: control of your risk, control of your emotions and controlling how much of Forex you let into your day-to-day life. You see, people become obsessed easily, ‘Forex junkies’ even. 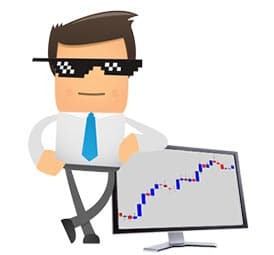 They let Forex trading consume their life and it kicks off a chain of self-sabotaging events – just like a gambler, alcoholic or drug abuser. Forex trading is a personal journey, one where you must face your inner demons and learn to conquer them before you see any progress. Otherwise your inner demons will become your worst enemy in the markets. 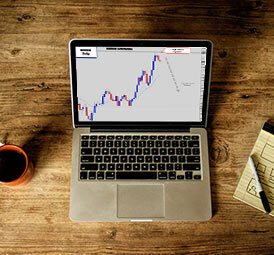 Many people are highly attracted to Forex trading – looking to escape their need to work a day job. Forex trading isn’t something you can just learn overnight, it is an epic personal development journey which is unlike any challenge you’ve faced before in your life. Be prepared to face your inner demons. New traders tend to shoot first, and ask questions later. I can understand, there is excitement burning inside you when you first discover the markets, all you want to do is get your hands dirty. 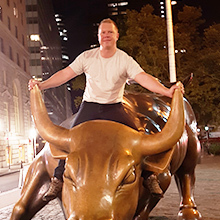 I remember my first deposit in the markets was $100 and I started throwing trades at the USDCAD – lost all my money in one go. That was fine, I didn’t expect to get very far, just get my feet wet. I am sure many traders have a similar starting experience. This is usually the point where you say to yourself “Ok, I need to learn a little bit more about Forex trading”, and you go off and get yourself educated. Learning how to trade from a text book only gets you so far. The market is such a dynamic place, where you’re rarely going to find those ‘text-book perfect’ scenarios. The real learning experience comes from involvement with the markets. Screen time is very valuable, whether it is good or bad. I am a strong believer of turning the negative of a mistake into a positive as a lesson for the future. If a text book tells you it’s not a good idea to do something, it doesn’t really have the same impact as going out there, personally making the mistake and feeling the sting for yourself. Hopefully you will learn from your mistakes, burning those neural pathways in your brain, and start to build a positive trading mindset. 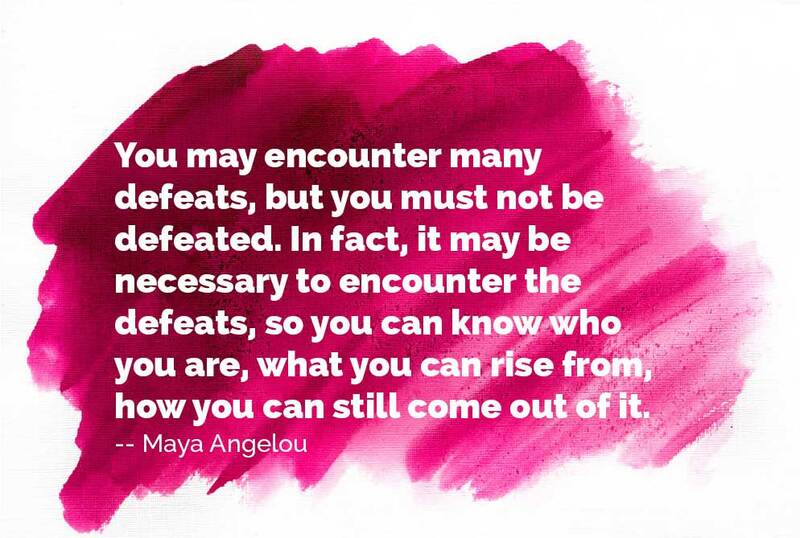 Those who don’t learn from their mistakes are the ones that get stuck in a vicious losing streak. They aren’t building a positive trading mindset and are most likely working from gambling impulses, or financial desperation where a “get rich quick” solution is needed. Mistakes are going to happen, sometimes your emotions will get the better of you – but it’s a feedback loop that should be teaching you and preventing you from making the same mistakes in the future. 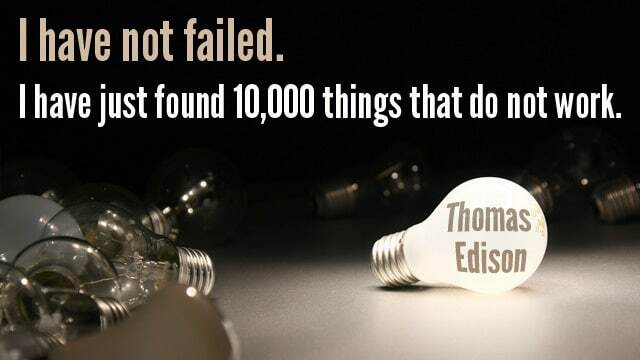 Learn to embrace failure, not become disappointed by it. The mistakes you make will carve out the way of success by revealing when you’re on the wrong path and guide you to the right rabbit hole. ‘Being wrong’ is a process of elimination that should be guiding us in how to be ‘right’ more often. If you want to be a successful trader, it is critical that you learn from your mistakes. Real screen time trading experience can teach you things a text book cannot. Use your mistakes as a stepping stone to move forward, but don’t be a repeat offender and keep expecting it to work this time. Your mistakes should illustrate unsuccessful pathways and help illuminate the right direction to success. If discipline was a muscle, the seasoned Forex trader would be like the ripped guy down at the gym – the person everyone looks up to and aspires to be like one day. For a Forex trader, discipline is your ‘will power muscle’. Just like your biceps, it needs strengthening and conditioning. We all possess different levels of self-discipline when we start trading, but in order to succeed we need to work hard on building it to an immense level. Kind of like when you’re starving and someone is waving a cupcake in front of your face tempting you, but you are strong enough to refuse it because it is not allowed on your diet. A lot of traders understand how important being disciplined is – but aren’t willing to do anything about it. 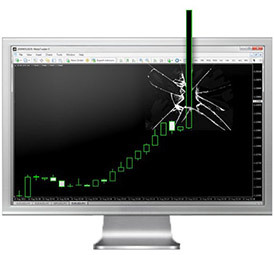 They become more focused on ‘tweaking’ their trading strategies, when the real problem lies with their own behaviors. It takes determination and perseverance to make self-discipline an integral part of your regular practice. Once you do, you’ll become stronger and tasks you once thought were difficult will become routine. They will require much less willpower and begin to feel automatic. Just as everyone has different muscular strength, we all possess different levels of self-discipline. Some people will excel in trading more rapidly because of their natural ability to avoid temptation. When you channel your self-discipline on a single purpose, look out! It’s like channeling sunlight through a magnifying glass. Naturally, people only have a certain amount of self-discipline ‘credit’ throughout the course of each day. Stressful events can be very taxing on your discipline reserves. Once that ‘credit’ is gone, you become more susceptible to temptation. If you’ve had a bad day, or the kids are screaming and you feel like you’re about to snap – don’t go and park yourself in front of a trading screen. Your discipline tanks are empty and you’re in a dangerous state of mind. Once you break your discipline, it’s easy to do it again and again until you’ve lost yourself. It’s like when you’re dieting and take one bite of a cookie and you’re thinking – “What harm can it do?” Then the next day you take just two bites, then before you know it you’re eating whole packets of them and you’ve lost control of your diet program. 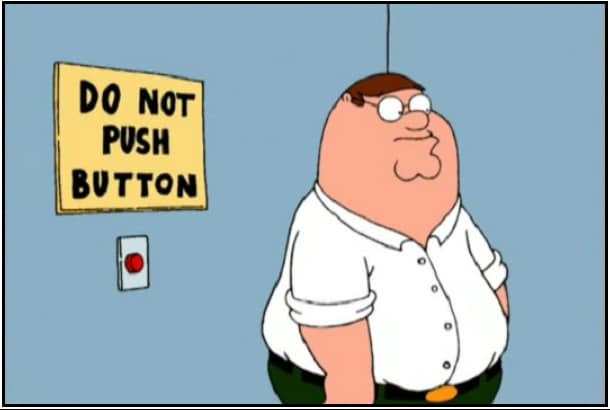 Unfortunately, our amount of self-control is limited – it’s those who can manage their self-control effectively that are able to perform the best in the markets. Self-control is a powerful resource that is incredibly fragile – work on increasing your discipline storage tanks, and make sure you’re never running on empty. Every trader knows discipline is key to success in the market – but most are not willing to do anything about it. Our amount of self-control per day is limited, once you break it – it’s hard to bounce back. It’s those people who have good management skills of their ‘discipline reserves’ that will find trading success much faster. Are you impatient? Do you make quick, snappy decisions and often get anxiety about things not progressing quickly. If so, you’ve got a lot of self-improving to do before you are ready for the markets. Patience is the ability to tolerate waiting, delay, or frustration without becoming agitated or upset. It helps you control greedy, selfish and impulsive behaviors which can destroy you very quickly. It’s the ability to be able to control your emotions or impulses and proceed calmly when faced with difficulties, because the truth is Forex trading has no shortage of emotionally challenging situations. Most traders put themselves in highly stressful situations like trading with high frequency where patience can run very thin, quick! People who don’t have good patience are people who insist things get done ‘right now’ and don’t like to wait for a result. However, some things just can’t be rushed. Things take time to develop in the market. I’ve been in positions that have taken a week just to get moving, let alone move into profit. 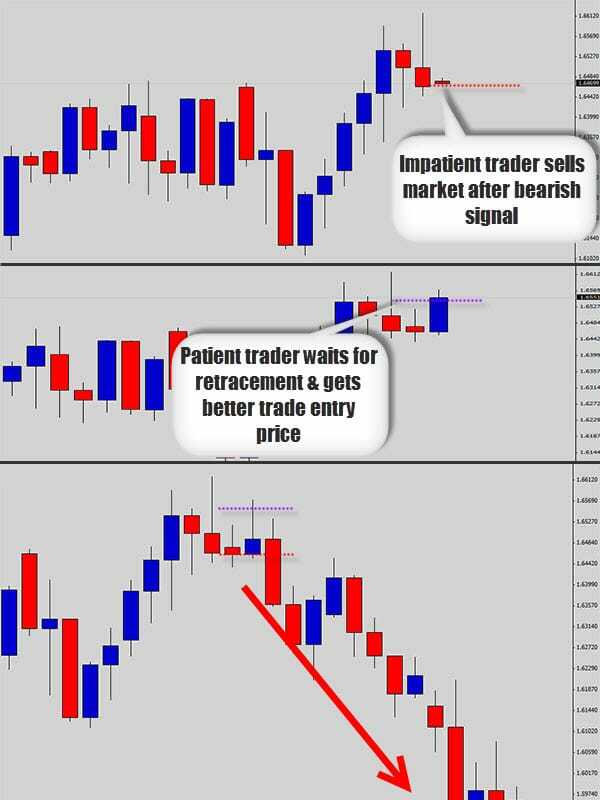 Traders are often getting caught up in the moment, becoming trigger happy and aren’t practicing patience when they should. 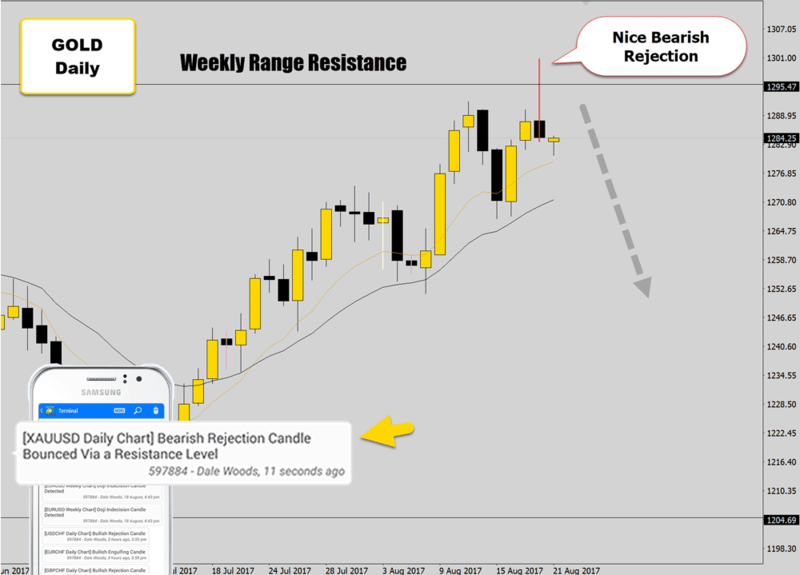 They don’t want to miss out on a trade signal as if it is a one in a life time opportunity. The market is forever, and there will always be another signal around the corner – perhaps even a better one. 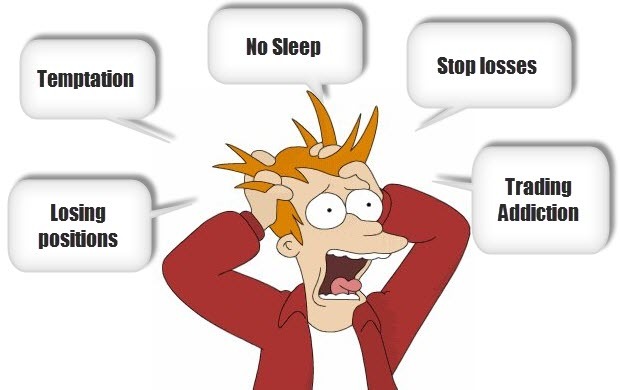 Many people become impatient due to physical factors such as hunger, dehydration, or fatigue. I know when I am hungry at the computer and I need to eat, it’s hard for me to stay focused and disciplined. Analyze your body the next time you start to get irritated with your progress. A simple fix might be a small meal and a glass of water! One thing good traders do is keep a journal – not only for your trades but for your emotions and thoughts as well. 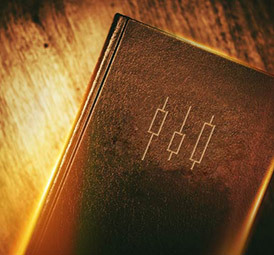 See my guide for keeping a Forex trading journal. Whenever you get that rushed feeling and the sense of impatience, write it down. This helps comparing how your emotions are negatively, or positively influencing your trading performance. Patience is the ability to be able to control your emotions or impulses and proceed calmly when faced with difficulties. Remind yourself that things take time to develop in the markets – you can’t be a good trader without excellent patience. Traders who put energy into self improvement factors like developing patience will perform better in the markets with any strategy. What is your job description as a Forex Trader? Do you know what the core focus and sole purpose is for a trader? It’s not to “make money”, and not even to find the best information. These are bonuses for doing the job properly. 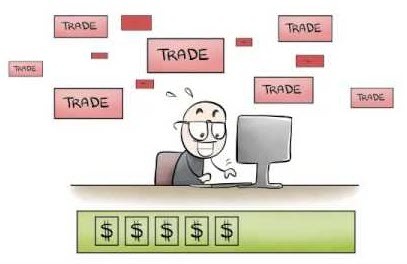 Your ‘job’ as a Forex trader (or even a stock market, commodities, equities trader etc. 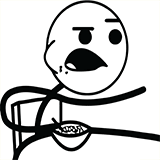 ), is to manage risk and be damn good at it. Most traders focus too much on making as much money as they can as quickly as possible. 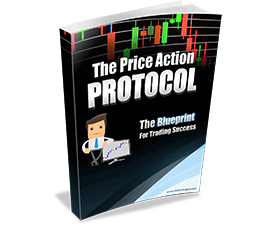 You can have the best Forex trading strategy in the world. But if you can’t master the skill of risk management, all the strategic edges in the world won’t save you from losing in the long term. The only way to avoid these pitfall is to remove the greedy thoughts of riches and instead place all your efforts on learning to be the best risk manager you possibly can be at all times. You must be able to leverage your self-control and patience in every situation, under any level of stress. By doing so, you will naturally become an excellent risk manager and the profits will roll in. This is why our Forex Price Action course is so heavy on our money management techniques. 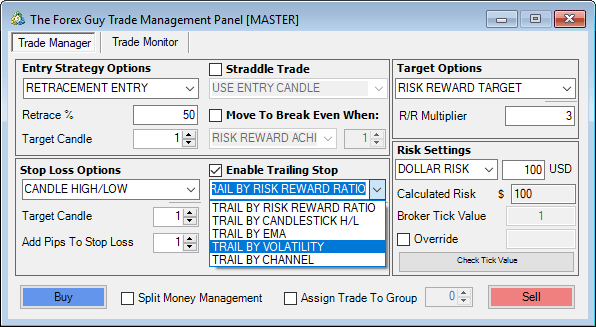 We even have a very clever split risk money management strategy that works extremely well in the markets. 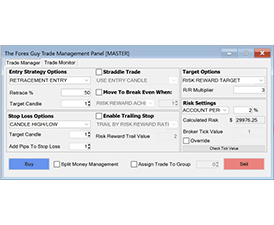 I’ve also developed some exclusive tools for war room traders which makes risk management a breeze. We focus primarily on money management models that are positively geared toward the primary goal; aiming for high returns on low risk investments. Our philosophy is simple, why chase after a thousand risky breadcrumbs when you can wait for a single, safer, larger “slice” of the action? Most traders want to believe the main focus is to make money, but your ‘true north’ points towards becoming an expert risk manager. Thrive and excel in this area and the money will come naturally. 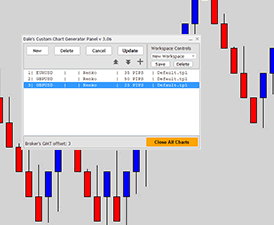 Forex trading doesn’t need to become a 1:1 switch for your day job. It’s actually quite possible to keep doing what you’re doing during the day and maintain trading at the ‘full-time’ level by only giving the markets about 2 hours of your time per week. It works out to be about 20 minutes per day, max! 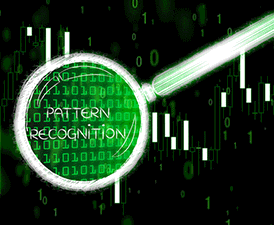 We achieve this by using a type of trading technique called ‘end of day trading‘ where you focus on the closing price of the daily candle to base your trading decisions on. This dramatically frees you up to do as you please during the day. So you can continue climbing your career ladder, or following other passions. I personally do my Forex trading and run a health/nutrition business at the same time. Forex trading shouldn’t dig into your life like an anchor. If you feel like Forex is negatively effecting your daily life, then you’re approaching it wrong and you need to remedy this – I’ve seen people get consumed by the markets and it’s hard to bounce back. How many hours on average do you spend in front of the charts every day? If you’re sick of putting all this time in and not getting anything worthwhile in return, then it’s time you were introduced to a more practical approach to trading that shows you how to really find and take advantage of potential opportunities with minimal effort. If you would like to learn about our end of day trading techniques, the two hour work week or our price action swing trading strategies – stop by and check out the War Room for Serious Traders. I am proud to say that I’ve helped many traders detox themselves of bad habits, free their time up dramatically and helped them see better results in the market. Until next time – best of luck on the charts! Thanks Dale, enjoyed it as usual, appreciate you putting the time to write and motivate , lots of us still struggling, I find discipline and patience ( same thing ) are the most we encounter in life,and they are by far the most difficult ones . its like trying to lose weight or to quit smoking ! ( neither of them ). thanks again and keep up with the good work.Cheers. 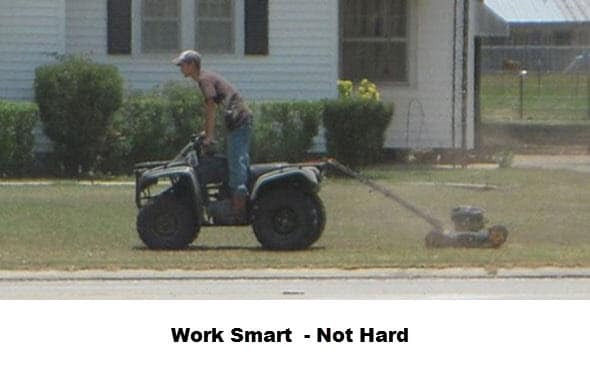 Great advice. Everything is on point. I am at the beginners level in forex and would love to understand it. 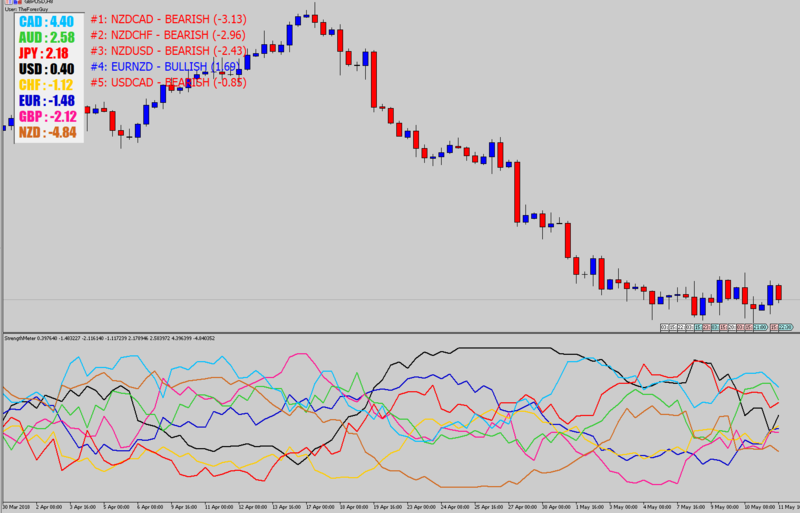 Where should I start in developing the skill of forex trading?